or a building by its exterior. I spent last week in Melbourne. One of the first things I noticed was how happy many of their buildings are. The one in the image above is home to an architectural practice, and as I sipped coffee at the cafe across the street I wondered if they were responsible for some of the other colorful building I had noticed around the city. I tried to imaging what it felt like to look out onto the world through this quirky exterior—how the shadows cast by this colorful exoskeleton altered the quality of light on the inside, which lead me to think about the relationship between the outside of a building and what goes on inside? More specifically, what should the outside of building designed to accommodate learning say to us as we pass by, and how does its form shape the learning it accommodates? 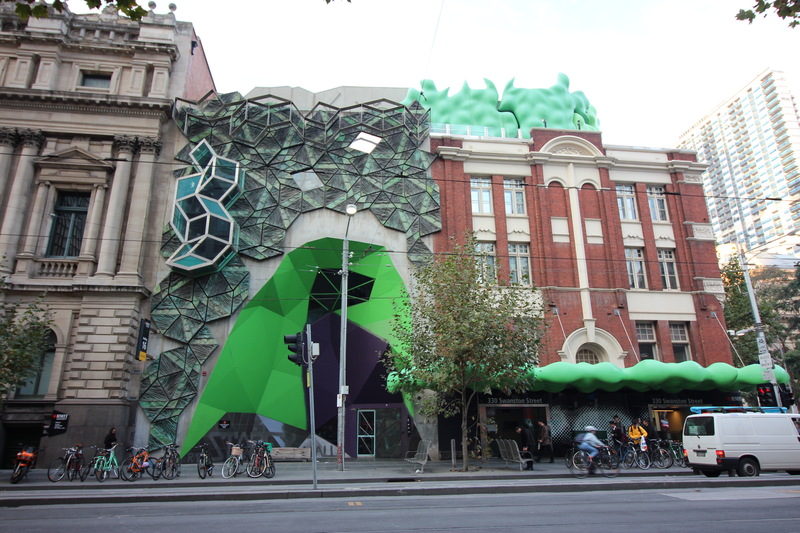 I was in Melbourne to speak with people teaching in the new home for the Faculty of Arts—Arts West—at the University of Melbourne. Having entertained these thoughts over coffee, my first impulse was not to stop and consider its exterior, but to climb the stairs and find a vantage point from where I could look out onto the world beyond. But I’m going to present you with the ‘cover’ first. Because, if I were to judge this particular book by it’s cover I’m not certain I’d have picked it up to read, let along be so willing to admit to being entranced by the perspective it gave me on the world. 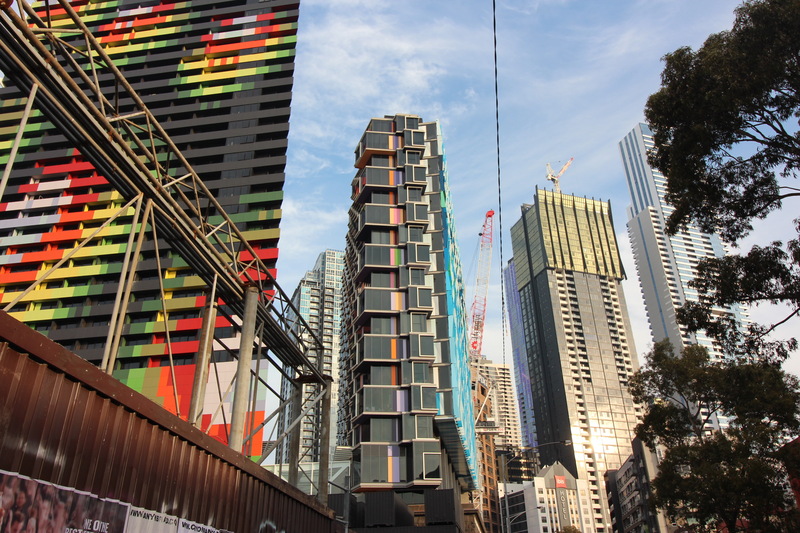 So, the wavy metal on the left, in the image below, is the exterior of the new Arts West building. Below is one of the views from inside. From this perspective it all makes perfect sense. This ornate exterior is a giant diffuser, creating learning spaces flooded with natural light and a gentle sense of movement across the views of an ever-changing landscape. Many of the people I spoke with mentioned the abundant light in these teaching spaces, and I spent hours thinking about how the landscape changed as I climbed the stairs to the sixth floor. I have to admit to becoming slightly obsessed with my ability to navigate the inside of this building based on what I could see outside—how much of the clocktower, trees or various buildings were visible as I rounded a corner or emerged from a secluded informal learning space. But what does any of this have to do with learning, and why should we care about light or expansive views onto the world outside—when this is a space for learning? The University of Salford’s, HEAD (Holistic, Evidence and Design) Project, lead by Professor Barrett (2013), demonstrated that 16% of the annual variation in progress of 3,766 primary school students could be attributed to the physical characteristics of their learning environments. Stated another way, if one were to move an average student from one of the least effective classrooms to one of the most effective classrooms, this change in learning environment could be expected to contribute to an advancement of 1.3 sub-levels per student, per year. Taking into account that the typical student in this study made progress equivalent to 2 sub-levels per year, this change is marked. And, whilst no single factor was dominant in this muli-level model, it is interesting to note that of the seven most significant factors (light, temperature, air quality, flexibility, ownership, color and complexity) it was light that ranked highest. In the Clever Classrooms (Barrett et al., 2015) summary report, the researchers note that “Good natural light helps to create a sense of physical and mental comfort, and its benefits seem to be more far-reaching than merely being an aid to sight.” They also make a series of helpful recommendations about how to create learning environments that make the most of naturally available light. But I want to know how light makes a difference to learners in any given learning space. Is it sufficient to assert natural light as a basic human need? And, if so, how do we balance this need with the needs of the digital classroom? Or more broadly speaking, how do we make decisions that take in the learning whole: set design (designed environment, tools and texts), social design (roles, divisions of labour and community) and epistemic design (task) and the learning theory that underpins it (Goodyear & Carvalho, 2014)? Goodyear, P., & Carvalho, L. (2014). Framing the analysis of learning network architectures, in: L. Carvalho, & P. Goodyear (Eds. ), The Architecture of Productive Learning Networks (pp. 48–70). New York, NY, Routledge. People like stories. The stories we tell ourselves help us to make sense of the world. In my last post, I briefly celebrated the creation of a new green space on campus. It was my interpretation of what I saw. An unloved building pulled down and in its place, not a shiny new building, but an open rectangle of grass. I marvelled that the land had been valued for its capacity to act as a momentary horizontal pause, between buildings, and not for its potential to accommodate vertically enclosed work space. All of which is true, but there is more to this story. The ugly unloved building actually had a name. The Transient Building. Erected in 1945 in the inter-war functionalist style, it was considered a temporary means of accommodating a rapid increase in student numbers, generated by the Commonwealth Reconstruction Training Scheme for returned ex-servicemen. The digital historical record of the building includes mentions of its flexible and functional architectural properties, its persistence despite its name, news of its demise, a flurry of images precipitated by its demise and even a dedicated FaceBook page. It seems that I am not the only person interested in the story of this space. Ten days ago, as I wandered past considering the practicalities of setting up a time-lapse camera to see how people colonised it over the course of a week, a month, a year……when I saw someone else setting up a tripod. I stopped to chat and found that they were taking photographs for an article in SAM (The Sydney Alumni Magazine). I’ve not thought anymore about how to set up a time lapse camera. I got diverted, thinking about how to communicate interest rather than surveillance. But I have had further cause for celebration. The other morning as I rounded the corner, I came to a halt. For, there on the grass, were two formations that were instantly recognisable to me as learning-circles. The story of ‘the learning circle’ deserves a blog of its own. But for today, my intention was simply to recored their emergence on the green rectangle, where the transient building had stood for over 70 years. Perhaps progress is non-linear and sometimes requires the intentional creation of open space into which learners are free to move. My morning walk from the station to the university campus where I work takes me through an area that has recently been gentrified, along city streets that are marked with spilt paint and chewing gum, and through a building site that resists all attempts to divert pedestrian traffic around it. I am curios but I’m not easily surprised, which made the morning of the 7th April unusual. After determinedly making my way around signs that offered an alternate route and carefully navigating a corner, I looked up. The quality of the light was different despite it being a grey day and I couldn’t help but smile, stop and dig out my phone. A site, recently raised to the ground and draped in cladding to hide ‘work in progress’, had been revealed. No construction. Just a green rectangle of grass, and to one side a couple of trees appeared to stretch out their limbs and settle in the breeze. I’m not sure who decided that land previously valued by the number of square meters of productive office space it could accommodate, would now be valued for its ’emptiness’. I look forward to watching how this space is used overtime. And to those who measure these things, I have not stopped to walk or sit on this patch of grass let alone work on it. But every time I come around the corner its presence gives me pause for thought and I breath easier. My thesis is now available via the Sydney eRepository. habits & HABITATS: An ethnography of learning entanglement – in PhD form – is finally finished. Four years in the making it will be accessible via The Sydney eRepository, shortly. Clicking on the image above will take you to an interactive time line that will give a feel for the learning environment that inspired my work. I am indebted to all who made this journey possible: staff, students and parents alike. Ethics approval for this work was grant under the following HREC Approval Number: Ref. 14289. NBCS, the school in which this study was conducted is well known for its innovative approach to learning and teaching, and has asked to be named. Whilst the school is identified, people have been given pseudonyms and images include only those for whom I have signed consent. The past two and a half years have been punctuated with moments in which I have become acutely aware of being both the object of my research – the learner; and the subject of the enterprise of – learning. So it comes as no surprise that the 2014 Networked Learning Conference provided me with pause for thought. In this post I will reflect on the experience of learning with and from the same people: at a distance and in person. Before the conference began the organisers hosted a number of online ‘Hot Seats’. More often than not I was an active but silent participant. I did engage and if learning is measured by change in the learner – I did learn. This learning was unseen, happening at a distance in silent asynchronous dialogue with people unknown. And it was not until I was invited to contribute something of myself, in the form of a sketch detailing my learning practice that I was visibly drawn into the online dialogue. I am interested in the places of learning and how they shape the activity of learning and this was an invitation to turn the mirror on myself. It was also something I could talk ‘knowledgably’ about in a legitimate academic space in a way that, somewhat inadvertently, made me knowable. I followed the contributions of others to this thread with interest and – in an odd sort of way I came to know those with whom I ‘chatted’. Many of the themes of our asynchronous dialogue remain delightfully unresolved in my mind and I continue to mull over them at odd intervals. Today, however, I’d like to reflect on the experience of being physically co-present and yet mentally distant. This is in no way intended as a criticism – it is merely an observation. For dialogues are two sided and I was at liberty to initiate conversation – and yet I didn’t? It was not until the conclusion of the conference that I returned to the thread and rereading it I noticed the quality of the exchange. I think we often equate physical proximity with higher degrees of engagement. Consciously or unconsciously we track eye contact, gestures and posture looking for clues about when to speak, how to speak and how are we are being received. All of these traces are apparently absent in asynchronous dialogue and yet I had had the opportunity to speak in person with these very same people. The ones with whom I had shared a lively, engaging and often personal dialogue – and, in the most part, I didn’t? I think this is interesting on at least two levels. First, there was something about the nature of that task that is worth exploring; and second, our characterisation of dialogue at a distance, as being distant – some how impoverished – needs revision. I’ve hinted at why I was initially drawn in. It was something that interested me and I felt I could speak with both authenticity and personal authority. It invited personal reflection on changes in practice in a world in flux. It gave me an opportunity to be known at a distance. Philippa Sheail, spoke about a project in which a Google map was used to encourage geographically distant participants in an online course to introduce themselves. They were not asked to place a marker that pined them, immutable and immobile, to their official places of residence. Rather, they were invited to populate the map with short, multi sensorial traces of their lived experiences of the places that were important to them. Examples included a note marking a favorite run, complete with the ability to visually travel this path at a distance, using ‘street view’. A second contained two images and an audio file: the first a desk complete with books, papers and a black cat, the second a view from the window alongside the desk and the audio file carried with it the sounds of the black cat purring. So I have something to say about why I think these types of task are valuable in bridging distance. As to our notions about presence at a distance, and distance when present – well, I will have to think about that a bit more. Suffice to say – they are not as fixed as we may have once thought? What of spatial (material) literacy? March 1, 2014 September 18, 2016 by pippayeomanLeave a Comment on What of spatial (material) literacy? Is it possible that we need to develop ways to teach material or spatial literacy? We talk about the need for digital literacy and whilst this is closer to the notion of literacy, as in reading and writing it is broader than the reading and writing involved in purely text based activity. What of reading a space or an environment? The ability to understand how to effectively respond to and combine the properties of ones environment to support ones activity or achieve ones ends? Having spent much of the past two years thinking about and watching people respond to learning environments as evidenced by their learning activity – it is clear that some do this more naturally than others. This of course led me to think about how one could increase the likelihood of people leveraging their environments more effectively in the service of learning – which brought me back to learning. That is how do (should) we teach material or spatial literacy?